Learning to read is a step-by-step process that should start at a young age. It is never too early for your child to be introduced to the wonderful world of reading. However, child reading development is a process that will take years to achieve. It is also important to keep in mind that every child learns at their own pace and should never be pushed to reading levels beyond their current capability. With that said there are several things to keep in mind when it comes time for your child to learn how to read. Building FundamentalsYour child will need to be taught how to read, however most children learn by example. If you read to your child, then your child is much more likely to be successful when it comes time for them to learn how to read. By reading to your child they can hear the sounds of words and associate them with the scribbles on the page. Pictures also help your child associate words with tangible objects. It is important to read to your child continuously as this will build a strong foundation for a great reader. Age GuidelinesIt is ever important to keep in mind that every child learns at their own pace, but the average child is able to read by first or second grade. Between ages 4 and 5 your child should be learning some pre-reading skills such as writing letters, recognizing and pronouncing simple words and learning rhyming patterns. Between ages 6 to 10 years old your child should be learning how to read, most of which will incur in first grade. 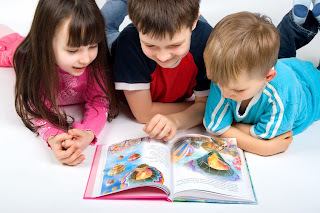 By the time your child reaches third grade they should be able to read independently. However, learning how to read should not stop there. During the years of 11 to 13 your child should be learning how to read to learn, which means they should be able to fully comprehend what they read and be able to learn lessons or knowledge from it. The Top FiveThere are five skills that ensures child’s reading development (see some interesting articles). The first of which is phonemic awareness, which is the realization that the English language is made up of various sounds. Second, is phonemic decoding, which is the ability to associate a letter with its sound. The other three building blocks include vocabulary, fluency and comprehension skills. Mastering these five skills will ensure the makeup of a successful reader.